Born Milwaukee, Wisconsin, June 5, 1999; single. Graduate Rufus King International Baccalaureate High School, 2017; B.A. in Business Administration, Cardinal Stritch University, 2017–present. Full-time legislator. Former nonprofit consultant. Member: City of Milwaukee Restorative Justice Advisory Committee (chair); BlackCEO Milwaukee Chapter (vice president); Determined Young Investors (president). 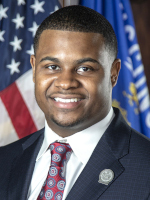 Former member: City of Milwaukee Youth Council (president).